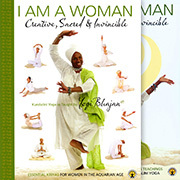 This extraordinary Kundalini Yoga book, I Am a Woman, Essential Kriyas for Women in the Aquarian Age, is a must have for every woman seeking enlightenment. Its clear organization will enable you to easily focus your practice on a specific problem. You can also open it at a random page to try something new. In each chapter you will find vigorous kriyas, meditations, and a mantra practice to connect with your inner wisdom. This is a companion book to I Am a Woman, Selected Lectures from the Women’s Teachings of Yogi Bhajan. Each set or kriya is accompanied by beautiful photographic illustrations, and includes detailed explanations of the different postures and also of the specific mudras (or hand positions) employed. The purpose of each posture and breath is clearly explained, enabling you to observe its effects. Each chapter begins with beautiful words of wisdom and support. The Aquarian Age has dawned. Using this book, Kundalini Yoga students can learn how to take advantage of these new energies to transform themselves and help change the world. Teachers can generate weekend workshops for students and, over time, create an entire curriculum for an in-depth experience of the women's teachings. 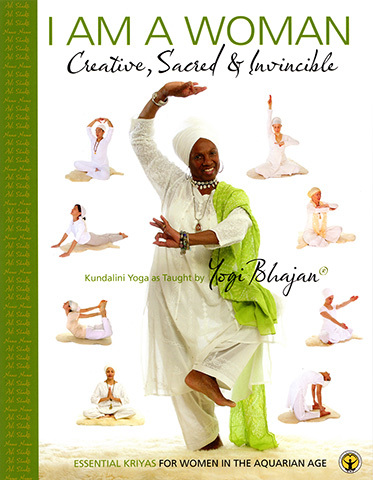 Cover design features long time student of Yogi Bhajan and a Kundalini Yoga Teacher Extraordinaire in her own right, Krishna Kaur.